Amaurobius similis, a lace web spider, measures up to 12 mm for the female, male to 8 mm. 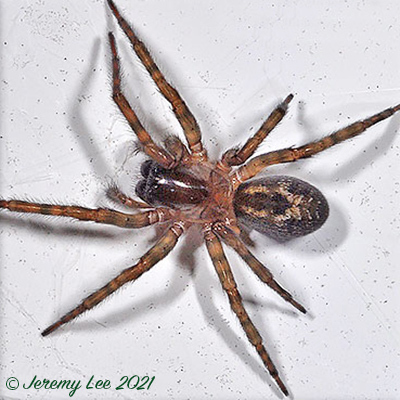 This spider probably occurs in almost every house and outhouse in the country. The spider makes its characteristic web of bluish cribellate silk in cracks in the brickwork, under the eaves, under undisturbed rubble or debris and between cracks in wooden sheds and fences, etc. It is also occasionally found under bark in more natural habitats like woods especially where these are near habitation. It is often found that A. fenestralis replaces A.similis in these situations. Adults occur throughout the year but both sexes peak in the autumn, and females are recorded again in numbers during the spring and early summer.